Johnny Dawson and Lawrence Hughes originally designed the golf course at Thunderbird Country Club and its tees opened for play in 1951 on the site of a former dude ranch. Historically, the club was the first to use golf carts and these were in action at Thunderbird from the early beginnings and this was also one of the first Californian desert golf courses to be constructed. Thunderbird Country Club played host to the 1955 Ryder Cup matches between the USA and Great Britain. Team Captains were Chick Harbert (US) and Dai Rees (GB). The Thunderbird course was only four years old and was considered insufficiently challenging for the Ryder Cup. However, the rough was grown and the fairways were narrowed enabling the American team, spearheaded by Slammin’ Sam Snead, to cruise to a comfortable victory. This was the seventh consecutive Ryder Cup title for the USA, which prompted Lord Brabazon of Tara, then president of the Professional Golfers Association of Great Britain, to pass his Winston Churchill-influenced comment at the closing ceremony. USA 8 - GB 4. The Ryder Cup was played at Wentworth in 1953 and at Lindrick in 1957.
and it wasn’t long before the Ford Motor Company heard about the place. 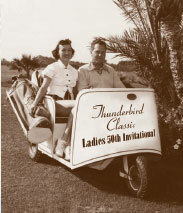 Ford subsequently named their iconic Thunderbird car after the Country Club and even used the club’s logo as the car’s insignia. Today’s golf course bears no resemblance to that of the original rock-n-roll layout. Thunderbird was completely remodelled in 1986 by Ted Robinson. However, it’s still a relatively short and pleasant desert layout, but further course expansion is restricted by attractive real estate that line most of the fairways.